Stained glass windows are mostly regarded as decorative aspects of Christian religious architecture such as churches and cathedrals. However, they have also been a fundamental part of other buildings, including the domestic setting of a family home. 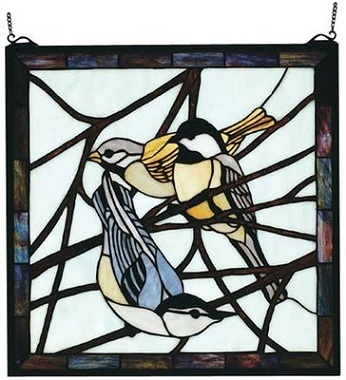 This beautifully decorated square stained glass window features three common little birds found in most backyards across the North American continent, especially where wildlife is encouraged and taken care off. Dark brown tree branches can be seen criss-crossing the main scene whilst three colourful birds, each in a different pose, survey the unseen landscape. The piece has been hand crafted utilizing a copperfoil construction process together with stained art glass whilst the border is made of a solid brass frame. The result is a delightfully colourful and light window decoration which can be hung against any window in your home. A mounting bracket and jack chain come included with the decorative bird-themed window. This means it can be easily attached to a wide variety of window areas regardless of what type of room one desires it to be placed within. Stained glass can literally transform an interior space and the jewel of light which is this three birds on a branch stained glass window make it an ideal addition for any room with a window needing something a little special to make it shine out. Another positive aspect is that these little decorative windows do not reduce light entering the home in any way and instead accentuates and makes more beautiful that which already does. If you have a love of nature and birds in particular then this will make a wonderful addition for your own home or an excellent gift for someone you know. You can buy it from here: Early Morning Visitors Stained Glass Window. One of the most beautiful but oft forgotten ways to add colourful light to an interior is through the use of decorative stained glass windows. A couple of aptly placed panels will completely transform a setting and make the room come alive with the particular design theme of the window. Whether it’s a window in the bathroom, living room, pantry or above the front door in the hallway, you can find styles in various shapes, sizes and subject matters. Stained glass windows are probably most well-known due to their use in the old churches and cathedrals of Europe which can look quite spectacular to say the least. This practice first began around the 2nd or 3rd Century and reached the zenith of its popularity in the Middle Ages. Since then, many decorative items and glass panels on furniture items have also been decorated using the same glass staining technique. 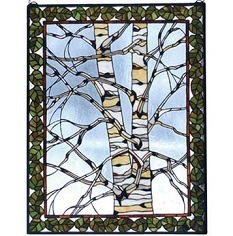 Subjects and themes one can expect to find on a stained glass window panel are wide ranging. The most popular however include scenes of nature and Christian symbolism. Flowers, trees and animals are popular design themes in a whole host of décor products and decorated windows are no exception. Other popular subject matters include fantasy figures such as fairies, elves, unicorns and Santa Claus, which can be used for a window in a kid’s room. Still others are purely abstract. Want to buy one? You can browse through a whole host of decorative windows here: Quality stained glass windows for the home. The primary role of energy efficient windows is to prevent air loss from inside the home. This in-turn means energy heating bills are reduced and the interior feels a lot more comfortable, especially during the colder months of the year. There are a few different kinds of insulated windows which will be suitable for a variety of locations and settings. Add to this fact, the technology is improving quickly and new window insulation types are emerging yearly. A basic format of the typical energy efficient window is the double glaze design. This acts in the same way two layers of clothing do by maintaining temperature, usually heat. However, with double window panes, both warm and cold air is contained which is beneficial for all seasons. Triple window panes provide the same benefits and work in exactly the same way but with additional efficiency. There is more to insulated windows than just the panes of glass. Gas can be added in-between the panes which provides a great deal more insulation that would be found otherwise. Such gasses include argon and the rather Superman-esque sounding krypton. Energy efficient windows can also be purchased with special coatings which improve the efficiency of the glass. These are often referred to as low-emission coatings. Infra red light which is a primary source of heat, is reflected thereby aiding the retention of heat in the interior. In the warmer months this also has the effect of preventing the home from overheating by keeping the heat outside. Another benefit of low-emission coatings is the prevention of ultraviolet light doing damage to fabrics and upholstery in the home. Whilst it won’t stop it entirely, the coating can reduce the fading of materials that are hit by sunlight on a daily basis, such as an expensive sofa or curtains. One can even find tinted windows that will reduce energy costs even more. The final element which is often overlooked when buying energy efficient windows is the material of the frame. In most cases, insulated windows will come with either fiber glass or vinyl frames but for a more aesthetic look, wood composites can also do the job just as well and are widely available.